San Francisco 49ers quarterback C.J. 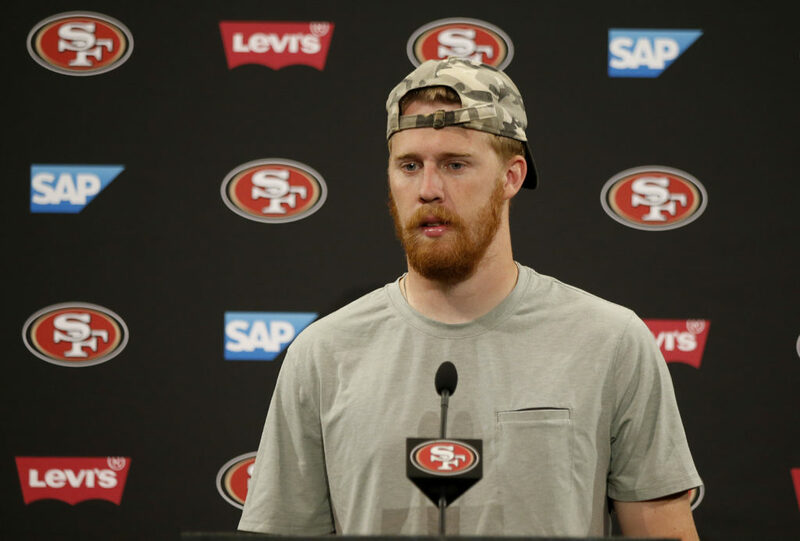 Beathard speaks at a news conference after an NFL preseason football game between the 49ers and the Dallas Cowboys in Santa Clara, Calif., Thursday, Aug. 9, 2018. (AP Photo/Josie Lepe)Check out my postgame report below. I agree with a lot of things you said in your periscope Grant, but not all of it. Especially about the 4-3 scheme. This team is snake-bitten with the injuries, same old tackling mistakes but some positives as well. -I remember seeing only 4-5 penalties and none of them were back-breaking. -Beathard was solid. Very glad for him. He is much better than other backups like Deshone Kizer, Brett Hundley etc. -Kittle was good and made a game-changing play. -Mabin was one of the bright spots in the secondary. We should see more of him in the coming games. -Gould is very consistent. He has only missed one extra point this season I think. Grant, they should have run more. 100% correct! I have questioned the money we threw at Juice and why he is not part of the game plans for over a year. Glad someone else noticed. Go back through the game, and tell me when we should have run more….On 3rd and 8, after 2 runs? Do you not see Derwin James crowding the line? 8 in the box, meaning were gonna take away the run game and make Beathard beat us. Where was Juszczyk today? Why wasn’t he lead blocking more often? Wasn’t juice injured Grant? Saw him laying on the ground for a long time, maybe he came back in and I missed it. That game was pandemonium. Couldn’t believe all the injuries. At least get Harbaugh’s strength and conditioning guy in here. Remember the weird stretches? Remember very few injuries? Good stuff. And I’m really glad we got rid of Reid?!?! This team will get better. They don’t yet have the players. I agree. We are playing with a bunch of backups.. I personally think the offensive scheme is there. This team is being competitive with 2nd and 3rd string players. Only reason I say run more is because the oline is still a work in progress. With all of these injuries, I think this team is still 2 more years away. Especially if you have an acl injury. It’s going to take them a year and some time to get completely healthy, especially as a running back. You can’t gel as a team, if half your starters aren’t playing. Saving grace is, all this is happening early. Plenty of time to get healthy before next season. Okay…..same old sheeeeeet year after year….we don’t have the players. Let me see could’ve ponied up more for MACK. Could’ve gave more for GORDON. They don’t care they have no clue what they are doing. Why would this rebuilding team give up so much for Mack? Even if they did, the rest of the roster is so burnt that not having 1st round picks the next couple of years would kill us. Then they would be spending so much in free agency just to compensate for what they don’t have, and spend it on mavk, and Jimmy. Now you have no cap room or draft picks. Bloated cap, back to square one, after you fired the regime that was dumb enough to do that. As great a player as Mack is, hes not fit to be on a rebuilding team. He’s fit to be on a team that thinks it’s ready to contend right now. So your right, it is the same old stuff, hopefully this regime gets the final product right. Cant wait to see mullens in action. C.j is not a game changer. Or even a winner. Can’t stand the dude. The Niners were shaped by the Chargers. I predicted they would stack 8 in the box, and dare CJB to pass. The Niners obliged by running bunched sets. The way to beat a stacked box is to spread them out wide, even if it means lining Juice out wide at times. If they lined up 2 wide left and 2 wide right, there would only be 7 in the box. Football sure is a game of attrition. I think 8 Niners had injuries and left the field. Glad some of them returned. Some say this team is bereft of talent. I think there is a lot of talent, but the coaching is lacking. KS needs to work on his game management. Maybe he should hire an OC to help with the offense, so KS could work more on the game management, defense and special teams. Yay, can’t wait to hear Saleh talk about his violent defense missing tackles, getting burnt and the excuses for a nonexistent passrush again….. This will be a yearlong theme until Shanahan cans his azzz. No lead is safe with this defense. I’m finished with this year. I stuck most of last year out but this start to the season is just to much. I now believe that Shanahan and Lynch aren’t going to take us to the promised land. The two of them now own this team. The team is worse then last years. Yes, injuries abound but bad teams always seem to have them. Something is seriously wrong with how the 49ers train. Strength and conditioning is just pathetic. Saleha will be around all year as this defense once again ends up near the bottom or at the bottom and Lynch and Shanahan will ride it down with him. Jed York is a real piece of work. A stadium I never care to go to. It has no feel to it. Just a bunch of CORPORATE TYPES going to the games. There is no team identity. Back in the day we had Montana, Clark, Lott, Young and others what do we have now? STALEY!! LOL! that guy is the most overrated tackle every! He’s a turnstile. The niners sat pat on MACK. Not enough GNADS to up the anti. Gordon my goodness could’ve got him for a song! Lets look at the play calling. 1. End of half he doesn’t just run the clock out he basically leaves SD two time outs. 3 points gone. 2. Your QB sells his soul to get a first down to keep the drive alive and you don’t have the guts to go 4th and one! What does that tell your team? 3. First and goal on the 7…..you dial up CELECK time which every team knows is the primary down there…..so you throw and brick hands lets the ball tip off his hands! How many times did we watch Jimmy take a 3-5 step drop and get crushed? So, last drive lets drop CJ to 5 steps and get his arm hit! BRILLIANT! That’s our Genius Shanahan! Shanahan, Lynch and York deserve each other! I’m just DONE! Hey I was so excited to see 94 Thomas in coverage of ANTONIO GATES! What a scheme! Please trade JUICE AWAY….you don’t use him why keep him. When will someone bring up the strength and conditioning coach as the single biggest weak link? I NEVER post on sites but cannot sit back as a fan any longer and watch knee/hamstring, shoulder, owee, etc. injuries derail us before we can ever even begin to see the full teams potential! So many missed games/seasons by key players!! Look back at the injuries for 49ers compared to other teams the last 2 years and it isn’t even close. Get a better strength and conditioning coach and I GUARANTEE we will see significantly less injuries thereafter…GET IT DONE!!! I’ve said the same thing. Something is wrong with the strength and conditioning. This is now two years in a row that we have more players on IR and basically taking up dead space on the teams sidelines. SALEH and the CONDITIONING coach both need to go. This was like an exact replay of our losing streak last year, good enuf to lose. From the coaching to the qb play. I’ll let all you experts break down the specifics, just read a Cohn post game report from last year pre jg. Shanny had many foolish mistakes today, the prominent one is he ignored the run game again and it still almost worked out, almost. Like when atl almost won superbowl, but ignorance got in the way. Amazing Breida was tied with Zeke for rushing yards despite having half the workload. No offence to Morris but there’s a reason he was available. 3 yards and a cloud of dust……. Yet this wasn’t Shannys biggest transgression. It began by NOT signing a 3rd qb after working out every possible qb option, other than the most talented and polarizing one, #7. KS told Cjb to play it safe outside the pocket, minimize contact. Smart strategy, except he called 3 plays early in this game that were to the contrary, plays that he never called for jg. First was a double reverse i believe where Cjb ended up being the lead blocker coming up left sideline. Then they ran what looked like a qb sweep a bit later, that’s rt ….. Cjb running a sweep. Throw in a qb sneak, which isn’t a huge deal unless you are already down to your back up qb, with a guy on the bench who hasn’t thrown a pass. Ironically cjb didn’t take major damage on those foolish calls, but would ultimately take a brutal hit on a heroic first down scramble. Lucky to survive that one, his toughness is well documented and a big reason he’s backed by the locker room and coaching staff. A very fine line seperates bravery and foolishness, we all were witnesses of that 7 days ago. I agree with your points on Saleh also. I am usually the one among my friends that is the calm, level headed one that tells them this is a process and they can’t build it all in 2 seasons etc… But the injuries under the Shanahan regime from day 1 til now have been absolutely through the roof!!! It MUST start with Ray Wright (head S&C coach). Saleh I believe just may be in over his head but I will reserve full judgement on that until week 12(ish) give or take to see how they truly gel. We don’t have all the pieces but should be much further along than we are. This defense gives up yardge and points in bunches. Very hard to watch…More talent than what is being displayed. Reminds me of the Nolan/Singgletary days until a competent coach Fangio took over and harnessed the talent. Steelematic, I am pretty much in the same boat as you. I never expected a playoff run even with a Jimmy G, McKinnon, and Co. Etc…I am the one telling my buddies who are impatient that they should be more patient and remember they had a lot of holes to fill and can’t fill them all this season. Still need a true bonafide #1 WR, pass rusher(or two) and even maybe 1 more good cb to be truly competitive with the big boys. Not too far off but….VERY far off if they can’t stay healthy to even field a full projected starter team. This is ridiculous at this point with the amount of injuries. I love this team more than anything and have been campaigning for Kyle Shanahan since the firing of Harbaugh. The S&C coach however I firmly believe is stunting this team and this coaching staffs growth. Too many injuries. Let’s get healthy, grow 1 more year and then evaluate. Yes sir. I’m with you. Good analysis. You do a much better job on video. I feel it is because it allows you to quantify your assessments in greater detail. I totally agree with your take on Breida, but I might also add one factor about your statement that Shanny gets too locked into his prep perceptions. He does not carry a real power back because he wants to be able to keep the opposition guessing so he gives up power for versatility. Yet when he gets to the goal line he always brings in Morris for Breida because he is assumed to be a more powerful runner. Morris is no Gordon or lynch. He is not going run over people and bully his way into the end zone. He needs space. I really doubt that Morris is that much more of a power runner than Breida. Breida also runs hard. But even if Morris is slightly better, constantly putting him in at the goal line signals to the defense that they are running up the middle. If he is going signal to the defense they will run up the middle they might as well use a real power runner and not a hybred like Morris. At least with Breida in the game they will have to account for his ability to run the edge and any other type of play they use him for, like a screen pass.